This post has been a lot longer in my folder than I anticipated, the days seem to suddenly just have flown by with all sorts of nonsense no matter how I prepare. :/ It’ll have to be a prequel instead. I actually chose “whoop whoop” a topic for getting some painterly skills back, while I ponder my problems with the figurative stuff. I do have ideas that include recognizable objects such as horses, a few tiny people and one very large fish! but I can’t draw for s**t without the aid of my computer. I always did best with a large brush. So while I was on the background production theme anyway, I grabbed “skies” off my multi page idea list. Simple, fits well with my photography style too. 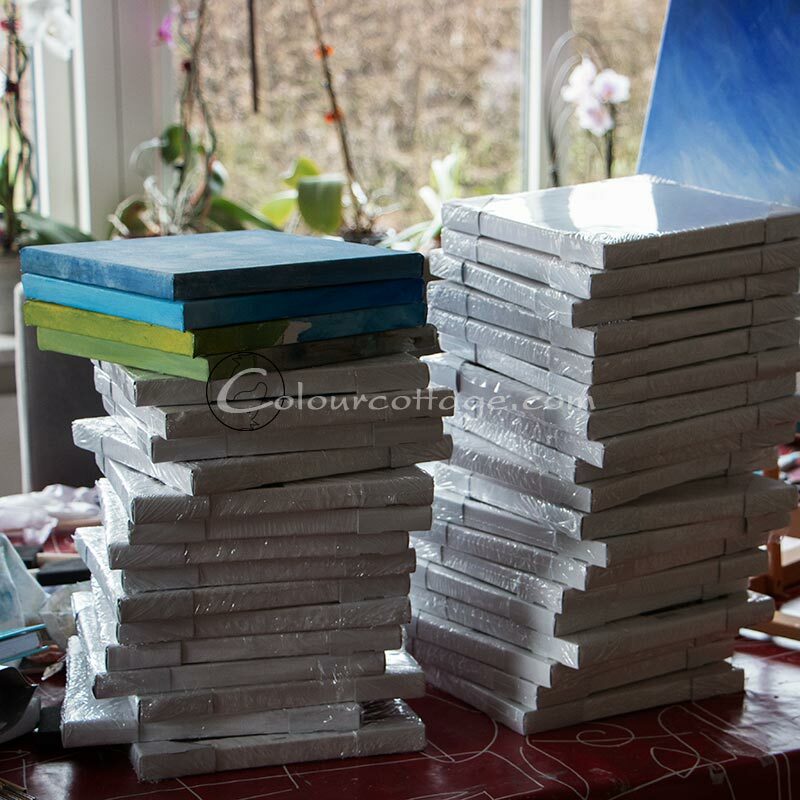 To make it even less complicated I got a stack of really cheap-get-what-you-paid-for tiny 20 cm canvasses that I seem to have no fear of attacking. I don’t like working acrylics on paper unfortunately and I’ve given up on watercolours just now, also to simplify my task list. So there. Supermarket canvas. Boards would be fine too, but I don’t have any. I got 12 canvasses, then G went insane and raided two more shops on our way home from the big city. It’s the first time ever that I’ve enjoyed working small. 50×50 and up used to be more like it, but for some reason I’m having a blast playing with these. (Still using 5 cm foam brushes, though 😉 ) Mostly just winging it, sometimes looking at cloud photos because I can’t quite remember the technique to paint them. My aim is not traditional landscape, really, so I hope eventually I’ll arrive at something that is “mine”. Currently I’m trying to get a feel for doing like I used to vs. wanting something different. Definitely fumbling, mainly trying to just do, not think. Wading through standard compositions to see if new things emerge in the process. Some of the pictures comply and resemble skies, others persist in remaining backgrounds, my usual syndrome. Sometimes I let them, simply swiping the remains of my palette before ending the session. I don’t know what’s going to be on any of the paintings beyond the next step, and sometimes not even that, no sketching, I just begin by throwing paint. 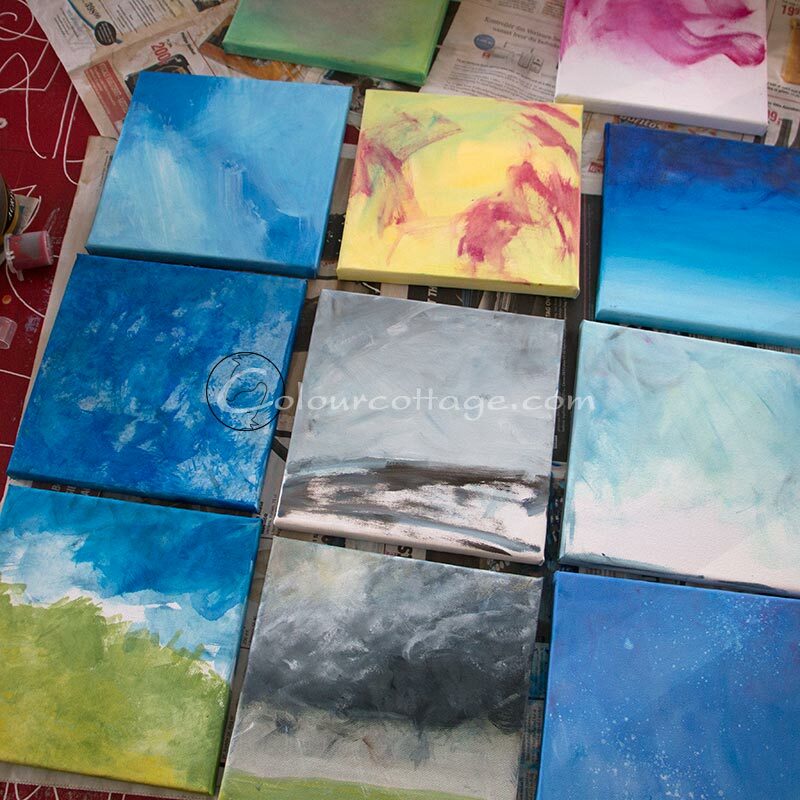 Makes life interesting… Some of these are getting A LOT of layers, another advantage over watercolour. When I run out of storage space I’ll have to auction them off to get money for a new batch 😛 If all else fails, there’s gesso! Perhaps this pile will last me forever?! While they dry, I play with some of the bigger wips. Colour blending exercises are fine too, I’m attracted to different combos than I used to, so I need to learn to make them, rather than my “goto greens”. Then we’ll see what happens. It’s a long way to go, but I’m not counting. I felt I could find space to paint at least 3 days a week when I began this post and definitely feeling the flow and the glow, but reality has been different. There is no gallery of 20 weather pix for you to browse, just a few beginnings and sketches. I’m going ahead and posting them anyway, since I started the journey here, I may as well keep recording it. I still feel it’s possible to pick up momentum again, if I’m “allowed”. If I allow myself. Complicated issues are happening on the sidelines and I tend to sponge some of it up even when it’s not mine to deal with. Wish me luck pls! I feel right in this element, so there has to be something more to it besides wasting supplies. During this process it’s slowly dawning on me what I do want to make, that is not like this. Maybe. Things are lurking in the mists at the back of my head that would like to come out. Or I’d like them to. So I can see what they are. 😉 Perhaps that will help me become slightly less obsessed? Wow! I particularly love your brooding grey skies – they’re stunning. Thank you for sharing your progress pics. It’s interesting to see the layers develop. I especially love the colors used in your clouds. I’m trying to not just make blue and white. But it’s actually hard to make proper cloud shapes, I have one that’s been redone at least 6 times and still looks too cartoon like. oh, I love these! While I adore blues and greens, your birch tree painting is lovely. Blue and green is also my first choice for nearly anything, but I’m trying to expand my horizons a bit. Thanks for “watching the show”! De er da flotte, det ligner meget skyer – i hvert fald de 5 første. Sekseren ligner en engel og nr 8 “moderne kunst” (det vi siger her i huset, når vi ikke helt kan se hvad det skal forestille). Jeg er også klart mest vild med birketræet. men også de andre har hver deres charme. Keep up the good work som Huntho siger. Tak 🙂 Det er egentlig kun de to første som er færdige, de andre mangler både det ene og det andet. Den moderne er et “tøm paletten” lærred, hvor du ser englen er jeg ikke helt sikker på, det er vist meningen der skal være noget hav nede i bunden, hvis jeg kan! Jeps en engel der svæver over vandene. Englen er lettere abstrakt, men min fantasi fejler ikke noget 😉 Du maler altså godt. Oh, those are really fun! I like how they look tiled altogether, too. They are fun to make. I’ll try to finish some more of these before I throw paint at another batch…. These are amazing, Pia! I just love them, really. I agree, tiled together they are even more powerful. Thanks for the encouragement! I’ll post them again and more when they’re actually done. I’m glad I found the key to just having fun (small size) rather than the all serious “must be an artist” scare of the big open white space. Thank you for visiting, every comment is deeply appreciated. Those little canvases look soooo familiar…. have you been following my* blog and looking at my website? If you end up specializing in skies, we will surely have to make skyscape a word on wikipedia! Skyscape should totally be a word if it isn’t already! I haven’t actually looked at anybody’s art before starting, I figured I could do that when I got stuck. But we do share a love of low horizons as far as I recall! I have a huge cloud library – somewhere on negatives, LOL. I think I’m a little stuck on trying to paint like I take photos, I may have to try to break out of that at some point. Or maybe not.